Flowering Season: Spring (late), Summer. 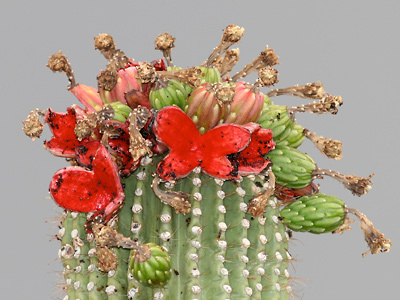 These cacti bloom in late May and June. Description: The flowers are 3 inches (7.6 cm) across and open in the evening. The flowers crown the stem tips and are followed by plump, red fruit filled with black seeds. The fruits split open into red, round-lobed, often starlike shapes that can be mistaken for flowers when seen from a distance. The tree trunk-like stems have prominent, accordion-like folds and wooden support ribs and are green, fleshy, and lined with spines. After 65-75 years or so, the columnar main stem can develop side arms. 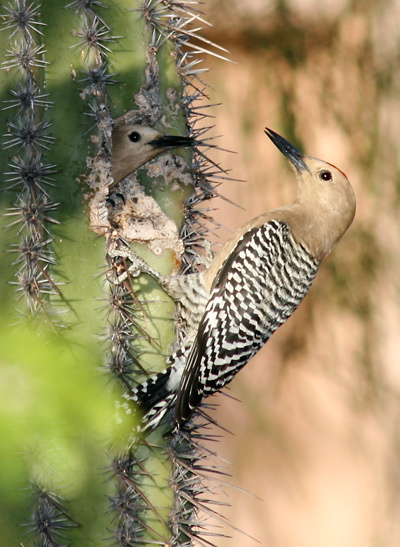 Gila Woodpeckers (Melanerpes uropygialis) create numerous nest holes in the fleshy stems, providing cool, insulated nests for many Sonoran Desert bird species. Nectivorous bats visit the nectar-rich flowers and the ripe fruit. The fruit is also enjoyed by birds like White-winged Doves (Zenaida asiatica), and the fallen fruit is eaten by a wide variety of animals including Javelina (Pecari tajacu). 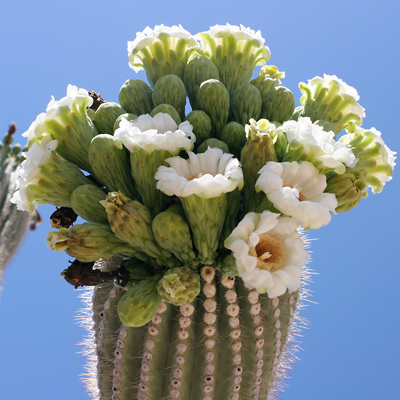 The Saguaro flower is the official State Flower of Arizona. These plants are available in native plant nurseries and are a popular addition to desert landscapes. 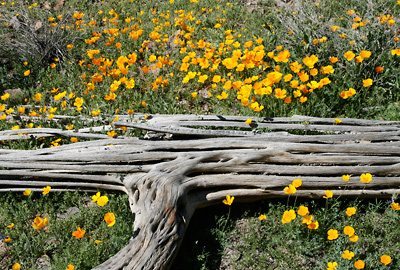 Saguaros are protected, so do not collect wild plants. 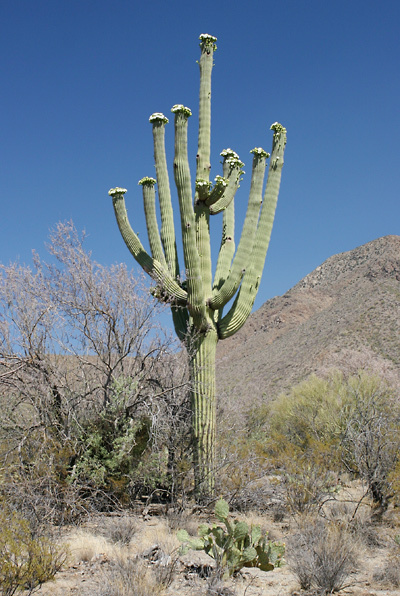 Culturally Significant Plant – The O'odham still harvest the edible fruit and seeds using special poles made from Saguaro ribs. The ribs were used for tools and in construction. Edible – The red fruit is sweet and juicy, and both it and the black seeds are edible.